My Name is hector I’m new to the Reprap community, even I'm going nuts to buy and build a 3D printer, i won’t have the time to do so, since i got a production to finish and I’m 10 behind. Why? Well i own a computer company, we only do wholesale, we buy, off lease (used) Desktop/ Workstations computers, LCD monitor and Notebooks. Most of the times our clients ask us to refurbish them. We bought 200 Mini Notebooks for one client and we found that around 50 of them are missing the battery release but, or battery latch. I already have created the Parts in Google Sketch up, and I can transfer them to DWG (AutoCad). They are small parts, about 6mm-W x 17mm-L x 4mm-H. Please see attach pix , since the latch has 2 small pressure post that clips in to the pivot that locks the battery I need them to be print in the best resolution in black color. Please send me your post with your quote, and delivery time. I will prefer someone with sales records on eBay. I will paid next day delivery via fedex for sample proof before you start production, and yes, if we get in to an agreement i will place a deposit and the rest of the payment once the sample are tested and approve. Thanks in advance, hope you can help me. P.S. I sell computers, So i got Desktops C2D 2 Dell Brand custom config(memory and HDD size you'll Like), and we have 4 HP WorkStation C2D That are excelent for CAD work. I got 19" "B" Grade LCD monitors ("B" small dark spot on screeen) at very low cost and also i got 22" LCD "B" Grade at excelent Price, you let me know maybe we can exchange. Thanks in advance, hope you can help me. Please find attach an example model of the part. P.S. I sell computers, So i got Desktops C2D 2 Dell Brand custom config (memory and HDD size you'll Like), and we have 4 HP WorkStation C2D That are excellent for CAD work. I got 19" "B" Grade LCD monitors ("B" small dark spot on screen) at very low cost and also i got 22" LCD "B" Grade at excelent Price, you let me know maybe we can exchange. You didn't need to post the same message twice, you can EDIT your posts if you forgot to add the picture. 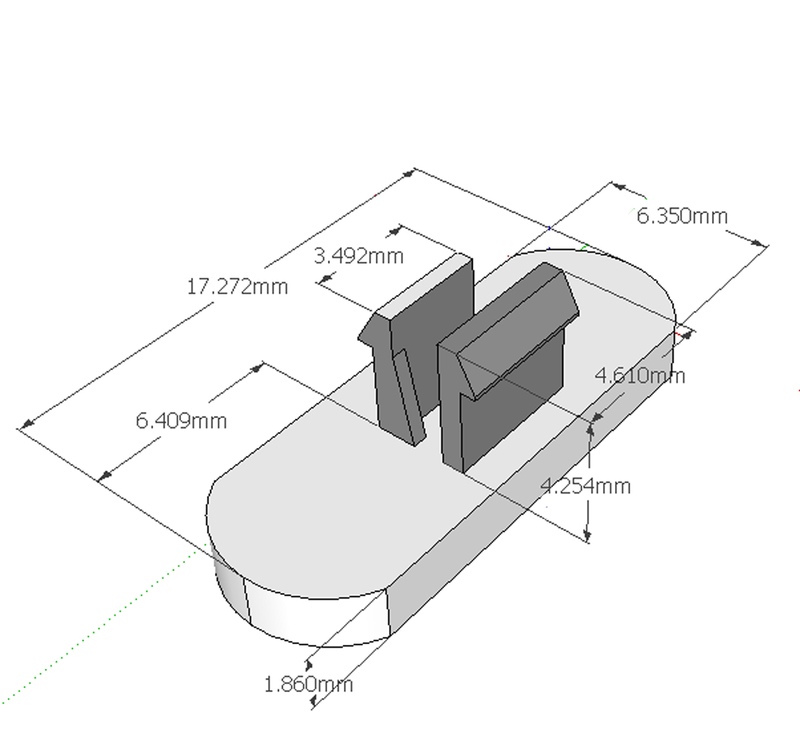 As you already have it modelled, you should post an stl export of your part so people can give it a try. Most of my technical comments should be correct, but is THIS one ? Anyway, as a rule of thumb, always double check what people write. You need to download the Google SketchUp STL export tool, see Exporting STL files from SketchUp gets easier. Also the Shapeways SketchUp STL export tutorial and the MakerBot Industries Google Sketchup article. Sorry for double posting, i dont know how to delete the post from this forum.